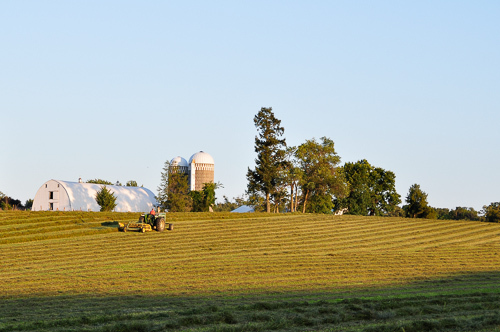 A local farmer rakes hay in the afternoon sun. This is done to dry the hay so it can be bailed. In my youth, I bailed plenty of hay and learned it was much better to be out in the sun on the rack as opposed to being up in the barn stacking it. This entry was posted in Uncategorized and tagged afternoon sun, agriculture, copyright ryan ware, family farm, farm site, field, hay, hay rake, oliver tractor, silo. Bookmark the permalink. Once again, the perfect use of light to create an outstanding image. I never had to bale hay, my brothers did. But I carried plenty of bales to the cows and cattle.